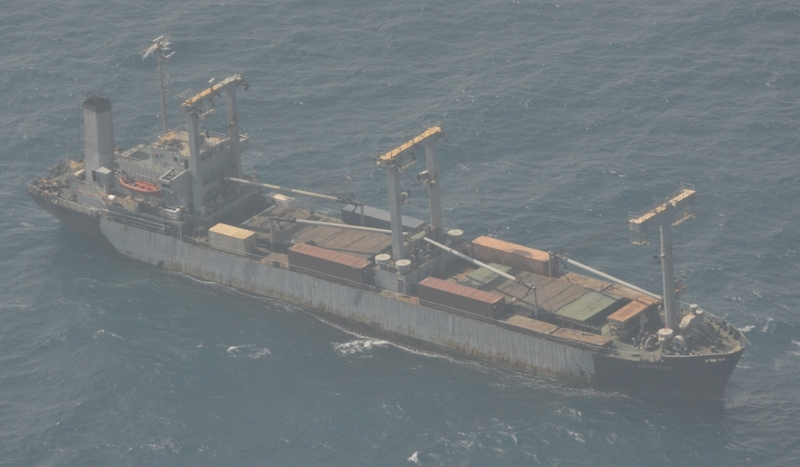 On the morning of 9 March, marine authorities received a distress call from the MV ARAK AFRIKANA stating that they were taking on large amounts of water due to what was described as a ‘hole in the hull’. The vessel had been released from pirate control only hours earlier. The EU NAVFOR warship SPS CANARIAS was immediately sent to assist the stricken vessel and was later joined by the Italian warship ITS ZEFFIRO which arrived first and carried out the rescue operation. The master of the vessel stated that the ship would probably sink in about 5 hours. 25 crewmembers abandoned the RAK AFRIKANA and took to the lifeboats. The crew were rescued by Rigid-Hulled Inflatable Boat (RHIB) from the Italian warship shortly afterward. The SPS CANARIAS resumed her Counter-Piracy duties once the situation was resolved. The RAK AFRIKANA was pirated on 11 April 2010. There is no information on the cause of the damage that led to the distress call. The rescued crew members are reported to be in satisfactory condition considering that they have been held captive for the last 332 days. It is not known if the RAK AFRIKANA is still afloat at this time. The rescue operation was coordinated by the EU NAVFOR Headquarters in the UK and needed close cooperation with the Italian Navy to ensure a safe and successful outcome. The RAK Afrikana is a 30-year-old cargo ship, small as ships go at about 8,000 tonnes DWT, flying what is called an "open register" flag, or Flag of Convenience (FOC). But this vessel is basically an ageing rust bucket surviving on the deficiencies in this system of "anything that goes flags". In this case, St Vincent & Grenadines, which just happens to also be blessed with a Governor General and a Queen, both from England, thank you very much. Long story cut short, a few days ago, the ransom was paid out, and the pirates abandoned the ship, which was literally on its last legs anyways. The sum is rumoured to be around $1.2 million. A total of 25 of the seafarers onboard were first transferred to an Italian warship, and then again to another merchant ship recently freed, and now headed for Mombasa . . .
Bottom line - wasted away in Pirateville. Canarias is I believe a Spanish and not Italian ship.